We are excited to announce the first of a series of Health talks hosted by our most recognised doctors and practitioners. 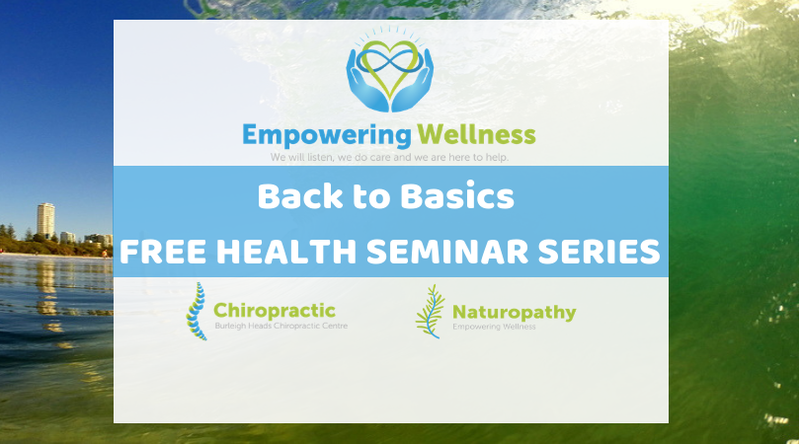 We will be offering these Free Health Seminars at our Empowering Wellness Centre Burleigh Heads, Gold Coast. As a passionate holisitc health clinic, we believe in educating the Community to better understand preventative ways to health, for themselves and for their families. – The need of bringing back the basics of good nutrition to avoid the onset of diabetes and periodontal disease. – How your nervous system plays a pivotal role in obtaining optimum health. – Simone Sleep has over 20 yrs in clinical experience as a naturopath and works alongside biological dentists to improve the health of those with metabolic and periodontal issues. Currently she is doing her masters in Medical Research to continue her passion learning about nutrition. – Dr Chris Ientile has over 34 yrs of experience and is highly trained in Holistic disciplines to heal and enhance the nervous system. He has a profound understanding of how the body works. Both presenters have a common goal and that is honouring the body’s ability to self heal and improve the function the way it is designed to. – A FREE Seminar based on natural health, that can help you and your family come back to a balanced state of Health. – Prevention of periodontal disease. – Physical, Chemical and Emotional balance for Nervous System Health. – No prior experience needed. It will deepen concepts for therapists and health practitioners. Give aways and prizes on the night. Seating is limited so first in first reserved a seat. Call to confirm your FREE seat on (07) 5535 9833. Wednesday 7th November, 6:30 pm. 1846 Lower Gold Coast Highway. Burleigh Heads.